Konica Minolta promotes information disclosure to and communication with stakeholders, based on the concepts of “transparency” and “continuity.” We disclose information about the environmental activities of the entire Group, through the issuance of reports such as this document and other mediums, such as an environmental website and exhibitions. Each of our business sites considers it essential to establish good relations with local communities through two-way communication, by providing regular opportunities to directly speak with local residents. We also actively disclose information via environmental labels, to provide details to users regarding our environmental products. We publish annual reports introducing the activities of the Group as a whole, as well as of individual sites. In fiscal 2005, we issued CSR Report 2005 to explain the entire Group' s measures toward reducing environmental impact, and to convey our respect for the environment. With regard to Site Reports that detail environmental information about individual sites, in addition to business sites already issuing Site Reports, five business sites in the Kansai region have began to issue such reports. 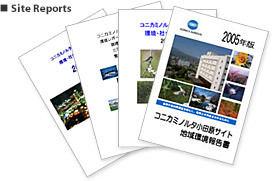 Our environmental website introduces Konica Minolta' s environmental activities, in addition to posting the Environmental/CSR Reports and Site Reports published thus far. Furthermore, our website features the “Let' s Enjoy Eco-learning” section, which offers fun for both adults and children in learning about environmental issues through quizzes, coloring and other activities. Konica Minolta has been active in acquiring Type I environmental labels as proof that our products are having less environmental impact. Concerning the Blue Angel Mark of Germany, the world' s first Type I environmental label, as of the end of 2005 Konica Minolta has obtained a greater number of that certification than any other manufacturer in the category of digital multi-functional peripherals, one of our primary product categories. In regard to the Eco-Mark, Japan' s leading Type I environmental label, Konica Minolta was first to obtain that certification in the “toner cartridges” category, which was newly established in 2005. This certification was granted for our toner cartridges PagePro1300W and PagePro1350W for monochrome laser printers. Under the Ecoleaf system, a Type III environmental label, we quantitatively identify and disclose the environmental impact of designated products throughout their lifecycle, ranging from procurement of raw materials to assembly, sales, use, disposal and recycling. Konica Minolta has also acquired “system certification,” affirming that we have a mechanism for appropriately and efficiently identifying such environmental impact data for our copying and printing businesses. In fiscal 2005, Konica Minolta obtained Ecoleaf certification for five additional models of copiers and printers. We have also registered the following categories of products with the Green Purchasing Network of Japan: copiers/multi-functional peripherals printers/fax machines, copy and inkjet paper. Environmental information on these products is publicized. The world' s first environmental label, introduced in Germany in 1978. Products and services certified as having low environmental impact are permitted to bear this label. This Program, implemented since 1995 under Japan-US agreement, uses the ENERGY STAR mark to label energy-saving OA equipment that meet its guidelines. Developed and administered by the Japan Environmental Management Association for Industry, the EcoLeaf is intended to disclose quantitative data on the environmental impact of labeled products. In the Kansai region, Konica Minolta has set up a permanent booth at Osaka ATC Green Eco Plaza in Osaka Nanko to introduce, in an easy - to - understand manner, our activities in copier recycling. As one way to communicate environmental risks in the context of the Japanese PRTR (pollutant release and transfer register) system, each year since fiscal 2002 we have held Community Environmental Briefings. 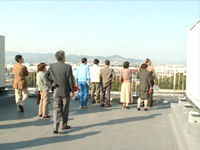 In fiscal 2005 we held the first Briefing at the Itami and Mizuho Sites, in addition to the Tokyo and Odawara Sites where the event is conventionally held. To maintain our high level of corporate transparency, we continue to promote the disclosure of information so as to maintain the trust and sense of security of local communities. We also readily accept plant observation requests from the local community, schools, the local government and companies both within and outside Japan. 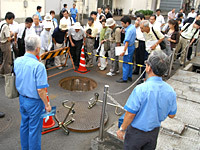 This Briefing was held on September 19 (a national holiday), 2005 with 32 participants. A plant tour was included, to show participants the underground solvent tank, refuse dump, wastewater outlets, rehabilitated area whose soil was previously contaminated, and the former plant site, as well as our fire drill, while giving explanations at each point of observation. During the tour, participants asked a total of 39 questions, which the accompanying Company employees answered. The tour was followed by a group discussion, in which we received as many as 25 opinions and inquiries, in a lively exchange. 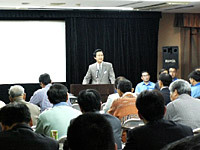 This Briefing was held on November 3 (a national holiday), 2005 with 48 participants. It was the first time the Odawara Site Briefing had been held on a holiday, so we had many new participants. On the same day we held a special noise-monitoring system observation meeting, to which we invited five individuals who resided in the vicinity of the plant. At the meeting, we examined actual noise conditions using graphs created with data actually recorded by the system, analyzed the difference in noise between the plant' s operating and non-operating days, and read the peak hour of bird song in the early morning. This Briefing was held on November 5 (Saturday), 2005 with 16 participants. This was our first Community Environmental Briefing in the Kansai region. During the plant tour, participants observed our manufacturing processes and workplaces, as well as the groundwater drilling survey area, dust collectors, Eco-ice air conditioning system, wastewater treatment plant, waste separation/resource recycling center and hazardous materials warehouse. Following the plant tour, participants heard our environmental activities report, which was followed by a question-and-answer session. 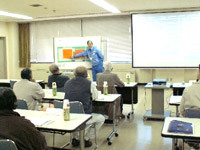 This Community Environmental Briefing, held on February 21 (Tuesday), 2006 with 7 participants, was the first held in the Tokai region. The Briefing program included a plant tour, explanatory presentations and a question-and-answer session. Members from the Aichi Prefectural Government' s Department of the Environment also participated in the Briefing, giving us favorable reviews and offering warm encouragement for future events. We are planning to encourage wider participation by relevant organizations and individuals, so the next Briefing will have many more participants.